We are hosting our first Wedding Open Day! 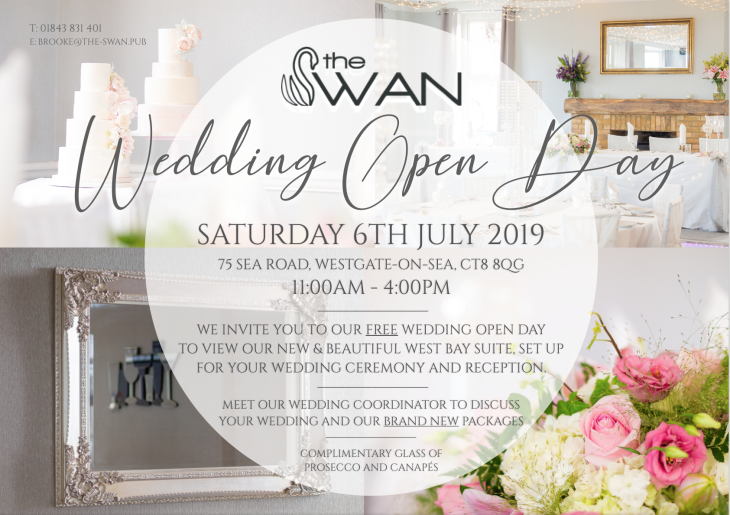 If you are planning your wedding and haven't yet decided on a venue, join us this July at our first Wedding Open Day for free and see what The Swan has to offer. Footsteps from the beach with stunning views of West Bay, our beautifully refurbished West Bay Suite is the perfect wedding venue. We are licensed to hold your wedding ceremony, wedding breakfast and evening reception, all under one roof - and with our dedicated wedding coordinator, brand new wedding packages and our excellent supplier relationships, you can say goodbye to complicated wedding planning and leave the work to us. Enjoy a free glass of Prosecco on arrival, canapés, tasty treats and getting plenty of information from our fantastic team.